Recent work by Marisa Abrajano and Zoltan Hajnal shows that views on immigration drives American voting behavior. But is the same occurring in other countries? A number of west European (i.e. not formerly Communist) countries have anti-immigrant parties. Known as radical right, right-wing populist, and extreme right, these parties vary quite a lot in their levels of xenophobia. But they have in common their desire to decrease immigration and hostility to to the European Union. 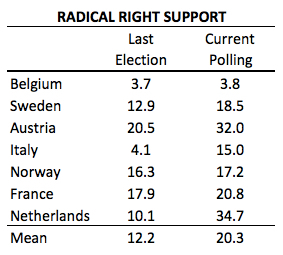 Both models assess simply whether support for radical right parties increased with time. The second model also includes controls for each of the 13 countries. 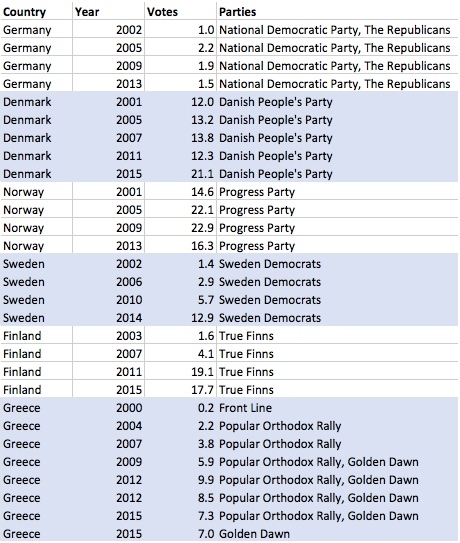 In several countries, anti-immigrant parties have gained substantial support since 2000. The True Finns received just 1.6% support in 2003 but 17.7% in elections held earlier this year. Extreme right Greek parties, such as neo-Nazi Golden Dawn, garnered 7-10% of the vote in recent elections, higher than the 0-6% they won prior to 2010. 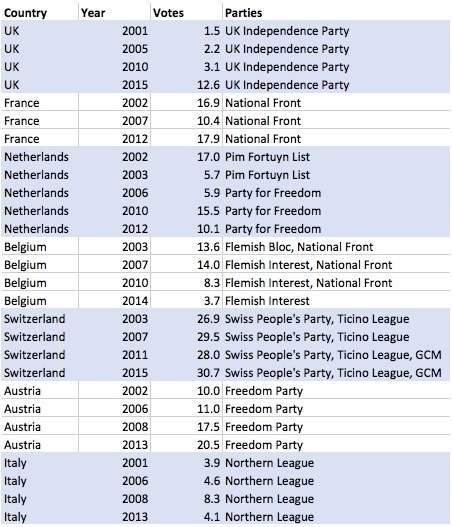 In Austria, the Freedom Party won 20.5% support in 2013–more than double their support in 2002. In the UK, Sweden and Denmark, support for anti-immigrant parties jumped substantially in elections held this year. The UK Independence Party (UKIP) won a 12.3% of the vote and the Sweden Democrats won 12.9% in this year’s elections. The Danish People’s Party earned 21.1% of the vote, much higher than their previous record of 13.8%. 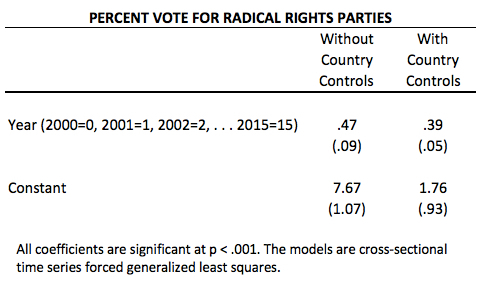 Other countries have seen smaller changes, or less consistent changes, so the countries where the radical right has gained strength drive the results in the statistical model. Only Belgium has seen support for the radical right decline as the small National Front has disappeared and Flemish Interest has lost support to the New Flemish Alliance–nationalist but not radical right. In short, the ongoing refugee crisis in Europe appears to be driving up support for anti-immigrant parties. The intensified battles over immigration in the U.S. reflect similar debates occurring in many other democracies. In future posts, I hope to bring the lens back to Maryland and the U.S. on the politics of immigration. John Gallagher used to blog here at Seventh State and has now started up his own new blog on Maryland politics called DMV Playbook. Best of luck to John and his new blog! I accidentally cut off the second half of Ben Kramer’s (D-19) comments on BDS (Boycott, Divestment, Sanctions) when I posted them earlier today. Here is the rest of his response to those who oppose legislation that would prevent businesses that support the BDS movement against Israel from doing business with the State of Maryland. The post got cut in the middle of thought, so I’m afraid the beginning here is a bit abrupt. Resolving the challenges of the West Bank are difficult and finding a path toward Palestinian self-determination is fraught with obstacles. Israel unilaterally withdrew from the Gaza in 2005 without any assurances of peace from its occupants. Since that time, the governmental authorities in Gaza have been taking tens of millions of dollars in foreign aid and have been using it, not to build new hospitals and schools and to create a homeland, but to purchase tens of thousands of rockets from Iran to be launched against Israeli civilian targets from the decrepit medical facilities and schools that do exist in the Gaza. Millions of dollars are spent to build multiple, sophisticated tunnels into Israel, from which to launch terror raids on children in school buses. Lesson learned…Israel does not have the luxury of making the same mistake in the West Bank. The BDS movement is driven by Israel’s enemies who are cleverly using relentless propaganda and lies to manipulate the willing, the naive and the uninformed in a time proven strategy to create enmity toward Jews. From the blood libel of the Middle Ages, in which Jews were accused of murdering Christian children for ceremonial purposes, to the Protocols of Zion and the government sponsored hate-mongering of Nazi Germany…the playbook of the anti-Semites has remained the same…tell the lie, and continue to repeat the lie often enough until the willing, naive, uninformed and misinformed, whether at a conscious or subliminal level, begin to accept it as fact. How else can we explain the difference of the pro-BDS advocates total disinterest in the nations that are committing egregious human rights violations (including the beneficiaries of the BDS movement) from the impossible standard, for defending its citizens, they have set for Israel…a standard that has never been applied to any other nation, including that of our own. Perhaps the efforts of those BDS supporting groups, who claim that they are motivated by a desire for peace, would be better off directing their efforts at convincing the Arab world to stop the formal (and informal) education process, of each generation, to hate the Jews. Maybe, if the governmental authorities of the West Bank and Gaza were willing to accept the right of the Jewish people to live in peace, in their homeland, there might actually be peace in the Middle East. After thousands of years of persecution culminating in the Holocaust, Jews are no longer playing the role of the willing victim and this undoubtedly has caused angst for those who are more comfortable with the Jew in her/his former role. Finally, for those who claim that boycotts are a time honored, peaceful means of protest, I completely agree with you. Yes, the apartheid government of South Africa was rightfully boycotted. However, the absurd effort to draw parallels between the South African government’s system of apartheid and the conflict between Israel and its Arab neighbors is simply fantastical…but clearly a critical element of the propaganda strategy as the BDS proponents never fail to mention Nelson Mandela and the racist South African regime in their endeavor to confuse and fraudulently link the two movements, to justify BDS. Those individuals who choose to participate in the discriminatory BDS movement are welcome to do so…that is called freedom of speech. 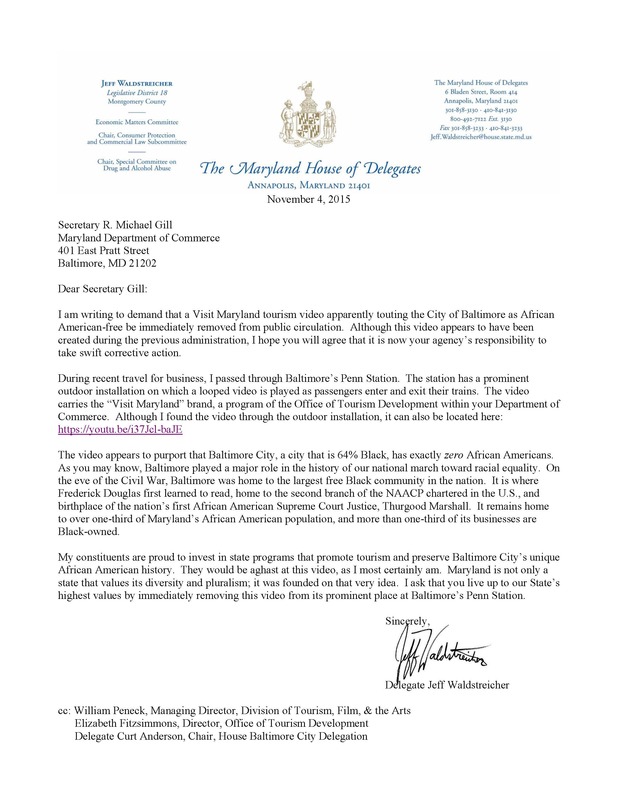 However, the people of Maryland do not have to see their PUBLIC dollars being used to support such discriminatory behavior, particularly when it undermines Maryland’s policy as articulated in its Declaration of Cooperation with Israel. An agreement which created a cooperative relationship which has benefited the citizens of Maryland and Israel through economic development, tens of millions of dollars in trade, the creation of jobs, as well as, significant achievements through joint scientific and medical research. Not using public dollars to support discriminatory behavior is also freedom of speech…and as you appropriately pointed out, David…if the boycotters truly believe in the right to boycott…then we should be free to boycott the boycotters. Like a classic garment carefully folded away in a drawer to be brought out and worn when fashionable again, anti-Semitism is once more all the rage in Europe. Nicely accessorizing it, on this year’s runway, is anti-Zionism. We should resist the urge to emulate the Europeans and reject the misguided, albeit chic, BDS movement fomented by propagandists whose end game has never been the well-being of the Palestinian people, but the destruction of the Jewish homeland and its occupants. Last week, several testified at the Montgomery Legislative Priorities Hearing against legislation that would prevent businesses that support the BDS (Boycott, Divestment, Sanctions) movement against Israel from doing business with the State of Maryland. The BDS movement is unequivocally a propaganda tool being utilized by Israel’s enemies to do what they haven’t been able to do militarily, defeat Israel. The goal of the BDS movement is to force a collapse of the Israeli economy, and in doing so, force Israel to withdraw from the small area of land, that Israel has not returned to its Arab neighbors, captured when the Arab nations (yet again) attacked Israel in 1967. To their credit, Israel’s enemies have done a phenomenal job of rewriting Middle East history to cast Israel as the aggressor in its dealings with the Arab world. Quickly being forgotten is the fact that the Arab nations have repeatedly unified (a feat in and of itself, because when they are not focused on efforts to rid the Middle East of Jews, they are often caught up in sectarian violence against one another) and launched wars against Israel for decades. In defending itself, in 1967, Israel captured considerable Arab territory. However, in a pursuit for peace, Israel has returned 94% of the captured lands to the Arab nations, which attacked Israel. My question to the BDS supporters, at the hearing, was to name another occasion in the history of the world when a nation that was repeatedly attacked by its neighboring countries, returned the land captured while defending itself, in an effort to achieve peace and stop further military aggression and war. I further discussed the violent treatment of women, gays and lesbians in the West Bank and Gaza, which is a routine topic of human rights organizations, and that such treatment is not only condoned, but encouraged by the Fatah led Palestinian Authority in the West Bank and Hamas in Gaza. Furthermore, both the Palestinian Authority and Hamas arrest, jail, torture and execute (if suspected of collaborating with Israel) those who dare to openly challenge their governmental authority. Therefore, my question of the BDS supporters was to identify which of the myriad of Arab countries, with their laundry lists of human rights violations, were they pursuing boycotts, divestment and sanctions against. The answer was zero, none, nothing . . . not one. Evidently, the xenophobic Palestinian governmental authorities in the West Bank and Gaza, with their extremist ideologies that call for the relentless pursuit of the destruction of Israel and the death of all Jews in the Middle East, are quite acceptable to those who support the BDS movement. Apparently, honor killings of wives, daughters and sisters and the treatment of women as chattel, along with intolerance and violence toward the gay and lesbian citizens of Palestinian controlled lands, is of little interest to the ..progressive.. thinkers of pro-BDS. I then questioned the BDS supporters as to which of the many nations in the world, dominated by despots and dictators, with unspeakable crimes against their own people and horrific human rights violations, were they pursuing a boycott, divestment, and sanctions movement against. Once again, the response was a resounding. . . NONE. And then they have the shameful nerve to be indignant that their actions are being construed, by some, as being rooted in anti-Semitism. Evidently, human rights don’t apply to the right of Jews, in the Middle East, to live in peace. The glaring hypocrisy of the BDS movement is simply blinding. And a group with the name Jew in the title, that supports the BDS movement against Israel, does not make the movement any less hypocritical. No one says, not even the Israeli people, that Israel is perfection. 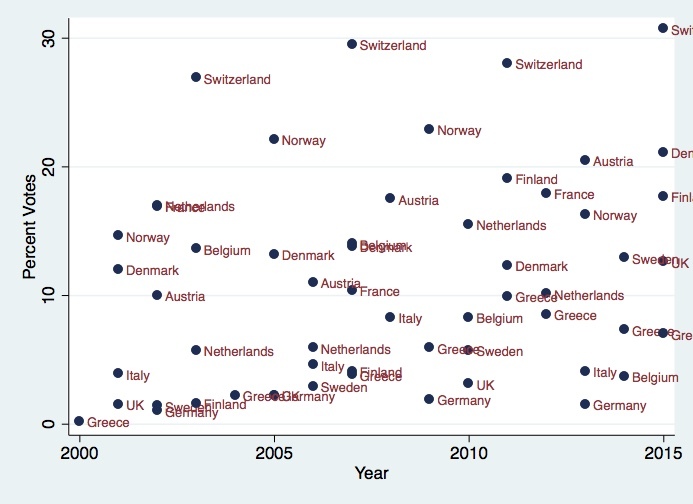 Yes, just like with all democratic nations there is room for improvement. However, amongst all of the nations in the region, Israel is the only one where all citizens, including the Arab ones, are free to express their sentiments. Either good, bad or that which is ugly, all are welcome to express their thoughts about Israeli society and the democratically elected officials who govern it. In fact, just two years ago, the Valedictorian at the most prestigious medical school in Israel was a Muslim Arab woman. This woman would never have had the opportunity to achieve such an accomplishment in the majority of the countries surrounding Israel and who are sworn to Israel’s destruction. Israel is a nation that fully includes women, minorities, Muslims, Christians and the LGBT community at the highest levels of academia, government, industry and business. Several members of the Freedom2Boycott coalition came to testify against legislation that would prevent businesses that support the BDS (Boycott, Divestment, Sanctions) movement against Israel from doing business with the State of Maryland. While I personally agree with many of my friends here about boycotting Israeli-based companies, organizations, and institutions because of the Israeli occupation and illegal Israeli settlements, I want to emphasize the wider significance of efforts to officially stigmatize or penalize boycotts. . .
As we saw once with the South Africa divestment campaign, one of the points of free speech is the ability to nonviolently — and victoriously! — challenge the status quo and challenge an outdated consensus. One of the points of free association is to be able to pick and choose whom we combine efforts with — and conversely, whom we will not support. Boycotts, divestments, and sanctions are a time-honored, honorable, nonviolent way of doing both. I hope you will resist all efforts to penalize companies or organizations engaged in such actions. Indeed, I hope you will go further, and support efforts to explicitly guarantee that political boycott, divestment, or sanctions campaigns can not be penalized by the state of Maryland in any way. Don’t just oppose using the state pension fund or the university system to chill speech — affirm that the state of Maryland, its counties, and its cities are not and may not be in the business of regulating free speech and free association in the first place. The problem with this argument is that, if one support strongly the right to boycott, presumably the State is allowed to boycott people who boycott. Clearly, the author doesn’t oppose state boycotts, as he cites the South Africa divestment movement an example–a movement that had promoting governmental sanctions against South Africa as a core goal. If this anti-BDS legislation goes forward in the next session it will be very divisive, particularly to members of the Democratic Party, and it will unnecessarily take up time and resources from productive activities in the legislature. There are many real priorities for the Montgomery County delegation, which will need the support and attention of the progressive organizations and legislators of the county. Anti-BDS legislation will distract you from work that is important for the citizens of this state. Proponents of the anti-BDS legislation claim that supporters of BDS are anti-Semitic and that the state can’t be seen as supporting anti-Semitism. This was specifically stated by the Republican governor of Illinois as he signed that state’s legislation. “We need to stand up to anti-Semitism whenever and wherever we see it,” Gov. Rauner said. This statement is a ridiculous attempt to smear the proponents of BDS. The people whom you will hear today speak against the anti-BDS legislation have spent most of their adult lives working for human rights and civil rights, and to characterize them as anti-Semitic is the height of specious nonsense. Jewish people themselves are well represented among those promoting BDS. Smear tactics are the tools of those whose ideas can’t stand on their own merits. Furthermore, using the term “anti-Semitic” inappropriately and recklessly for political reasons, trivializes real anti-Semitism and demeans the experience of Jewish people who have suffered from it. Del. Ben Kramer had a lot of fun with this argument, asking repeated questions about the human rights records of various countries with abysmal human rights records and whether BDS was organizing any boycotts of these regimes. UPDATE: Visit Maryland has now removed the video from YouTube. Twitter reports that it is also gone from Baltimore’s Penn Station. @visitmaryland is so far quiet on the subject. Visit Maryland has air-brushed African Americans out of Baltimore. If the above official tourism promotion video, playing on an endless loop in Baltimore’s Penn Station, is to be believed, more giraffes live in Baltimore than African Americans. Black people should not be deemed too scary to feature in videos touting any part of Maryland. Nevertheless, their absence is especially glaring–and I imagine galling–in a video about majority-black Baltimore City. Beyond the blatant racism, the video is also economically foolish. African Americans have a lot of tourism dollars to spend. As Del. Waldstreicher points out, there is enormous cultural and historical richness in Baltimore black history. Don’t we want African-American tourists to think of Baltimore as a potential destination? Whitewashing Baltimore is not going to make Baltimore more appealing or its well-known problems go away.